Jason Hicks and Troy Henderson have been singing, songwriting and playing music together for well over a decade. They were also born on the same day at the same time, two years apart (but we’ll let you guess which one is older!). Probably best known for their work in Central Coast band Field Day, Jason and Troy toured the East Coast on numerous occasions, released three EPs and received some healthy airplay on Triple J and many community radio stations between the years of 2000 and 2003. They also played some of the states most prominent venues including the Sydney Opera House, Star City and the State Theatre and have supported some of the country’s biggest bands including The Whitlams, Jet, Diesel, Xavier Rudd and Missy Higgins, not to mention a 30 date tour with Human Nature. 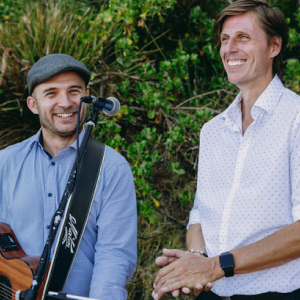 Most recently the boys have become an in-demand duo (and trio with the addition of a drummer) for corporate functions, events and weddings in the Central Coast, Hunter and Sydney regions.